HUGE price reduction, owners want an offer!! Excellent turn key business opportunity! This restaurant is move in ready with many opportunities for dining, banquets, private parties, etc., in this nearly 6,000 sq. foot well maintained property. New roof and furnace. This property is centrally located near Bemus Point/Lakewood/Mayville. 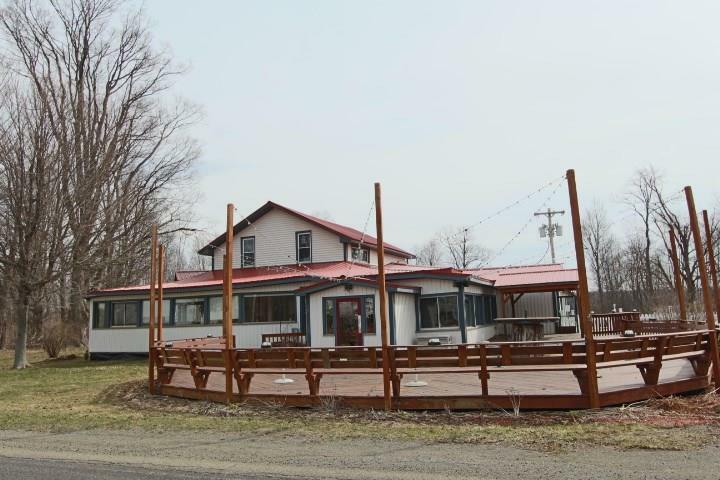 The outside deck allows for outdoor dining/live music for beautiful summer nights near Chautauqua Lake. The inside dining area is modern and has the feel of an upscale dining experience. There is also a full bar with access to the fenced in patio with fire pit. This business has been operated as a seasonal restaurant, but can be operated year round. Don't miss the opportunity to own a successful business. Directions To Property: From Lakewood/Jamestown, Head West On 394, Just Before 86 Take Right On Hadley Bay Road. From Bemus Point Take Chautauqua Lake Bridge, Use Lakewood/Mayville Exit, Take Left On 394 Then A Left On Hadley Bay Road.